About 1.740 light years away from the Earth, the Kepler-107 star is a little larger than the Sun and emits a slightly higher amount of energy. So far in its system 4 planets have been discovered, all very close to it with the consequence that they’re all very hot and therefore even if they were all rocky planets the conditions on their surface would be really hellish and inhospitable for life forms similar to the Earth’s. The two innermost planets, which have an average distance from their star of about 6.7 and 9 million kilometers respectively, have a similar size, estimated at 1.5-1.6 times the Earth’s. Their orbits are very close so we’d expect two twins, with very similar characteristics, but they turned out to be two very different twins. The researchers studied the Kepler-107 system for three years using the HARPS-N (High Accuracy Radial velocity Planet Searcher for the Northern hemisphere) spectrograph on the Galileo National Telescope, which is designed exactly to characterize rocky exoplanets. Taking advantage of the passages in front of their star of the exoplanets Kepler-107b and Kepler-107c, whose year lasts about 3.3 and 4.9 Earth days, and the oscillations that cause on it with their movements, it was possible to calculate their size and their mass, allowing to obtain their density. The surprise came when the data showed that Kepler-107c has a mass that is about nine times the Earth’s while Kepler-107b has a mass that is about three times the Earth’s, a huge difference. Even taking into account that there’s some difference in their size, the density of Kepler-107c is more than twice as its twin’s. This suggests that Kepler-107c has a larger iron core than its twin planet’s but the issue needed to be studied to find an explanation. The evolution of a planet can be influenced by the loss of materials caused by extreme X-ray and extreme ultraviolet (XUV) emissions from its star. In this case, the planets are very close to Kepler-107 but if that were the cause Kepler-107b should be the denser one because its star’s emissions sweep away the lighter elements and compounds leaving the heavier ones. For this reason the researchers considered the impact hypothesis more likely. 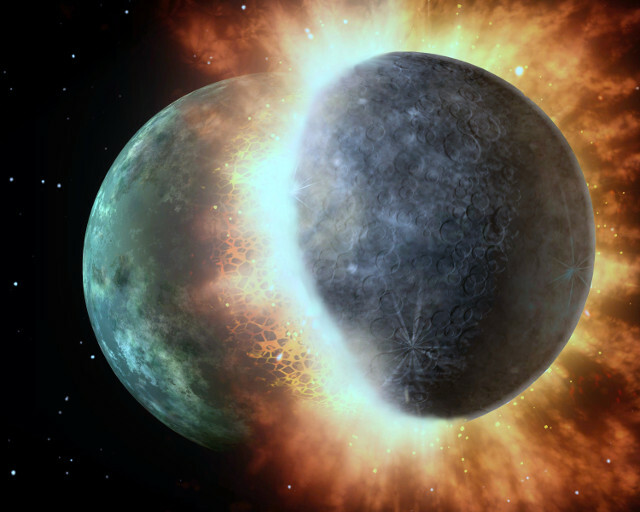 A collision of a Mars-sized planet with the primordial Earth is probably at the origin of the Moon and the Pluto-Charon pair could also be the consequence of an impact. Other solar system planets also have characteristics that could be consequences of impacts but Kepler-107c could be the first exoplanet for which there are clues of that type of event. According to the researchers, shortly after its formation, the exoplanet Kepler-107c could have been hit by another planet of similar mass or by a number of protoplanets of much lower mass. If its mantle was broken up, the amount of silicates that originally composed it may have been reduced compared to iron, which instead increased, making it denser. This interesting study shows new possibilities in the study of exoplanets. To understand their characteristics reconstructing their history is needed too so the case of Kepler-107c could be only the first of many, also thinking that instruments such as Gaia and TESS are increasing the information that can be collected and other instruments will be added in the next years.